Mercer returns to the q studio to talk about his newly published collection of essays, and to look back on his greatest rants from 15 seasons of the Rick Mercer Report. 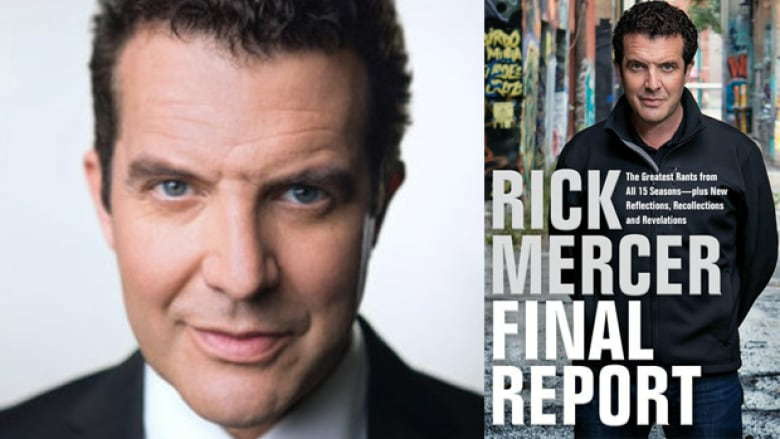 The king of the rant, Rick Mercer, is back with a newly published collection of essays and greatest rants, called Final Report. Mercer joined host Tom Power in the q studio to explain why he wanted to look back on his 15 years from the Rick Mercer Report, which wrapped up its final season in April 2018. "I stopped a job after 15 years — a show that I loved —and that involved some reflection, which I'm not prone to do." Speaking with Power, Mercer recalls his first professional rant when he was only 16 years old, washing dishes in a restaurant in St. John's. It was there that he met a CBC producer who gave him his first shot after Mercer repeatedly insisted that the producer should put him on the air to do commentary. "One day he said, 'Well, how about tomorrow?' I ended up doing it, and it went OK. I think the big thing I had going for me was that I didn't sound like I was 16. I always sounded older, so you know, I did three or four [rants] and that actually led to me doing a rant on CBC's Midday." Mercer later became a regular on This Hour Has 22 Minutes, and in 2004, his signature show debuted as Rick Mercer's Monday Report. This early iteration of the show included a segment called Celebrity Tips, where iconic Canadians, such as Margaret Atwood, would teach Canadians something simple, like how to stop a puck. One of Mercer's favourite stories from his new book is when Canadian author Pierre Berton appeared on the show to give his own Celebrity Tip: how to roll a joint. "[Berton] said, 'If we're going to do this, you have to do one thing for me: bring the weed,'" recalls Mercer. "We hadn't thought about it at all, and I don't smoke weed, so I was like, 'Right, I guess I could bring the weed. I'll talk to my props department.' He said, 'No, no I'm not rolling oregano on television. I'll look like a fool!'" Given that this was years before cannabis legalization, the segment with Berton was considered edgy at the time. "It was our very first year, and I can tell because as time went on we became a family show," explains Mercer. "When we started I didn't realize we were a family show so we were a little edgier." Today, there are a number of topics that Mercer would like to rant about, but he says he can always still do it unofficially. "I still rant. I just call people on the phone, and I think they lay the phone down and start making a sandwich or something while I'm ranting," Mercer jokes. "The great thing about these days is that if I really felt like I needed to rant, and get it out there, I guess I could just take my phone and go into the alley and start ranting... But no, I'm not going to do that." Mercer's new book Final Report is out today. Click listen at the top of this post to hear the full interview with Mercer, where he also reflects on the art of ranting and what he took away from 15 seasons of railing against the world on the Rick Mercer Report. Produced by ​Ben Edwards. Written by Vivian Rashotte.